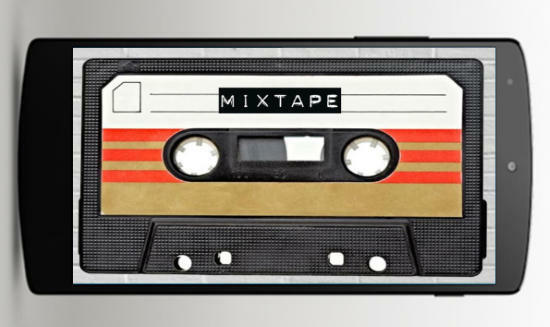 Here are 10 free mixtape maker apps for Android. Using these apps, you will be able to create mixtapes by adding your favorite music tracks. Almost all of them allow you to add unlimited songs to a single mixtape and export it to your phone. All the created mixtapes are stored in your phone storage as M3U files. You can play the mixtapes using any music player that supports importing M3U files. Some of them even have their own built-in music player which you can use to listen to the created mixtapes right away. Many of them also allow you to manually reorder the music tracks inside a mixtape such that you can listen to them in any desired sequence. These mixtape maker apps are quite similar to that of other core mixtape maker websites and [link this]software and can make custom mixtapes seamlessly. Most of these apps are actually custom playlist makers, but you can still use them to make mixtapes and export them to your phone storage. Let’s get started with the mixtape maker apps. 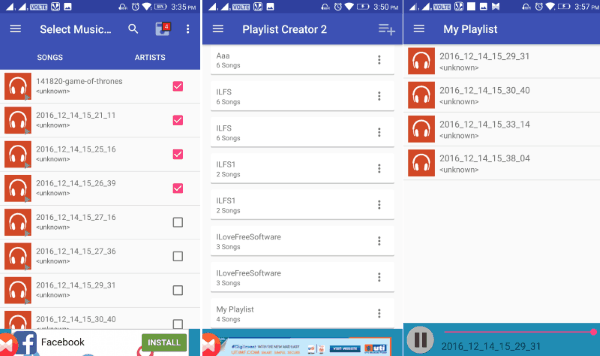 Playlist Master is probably one of the best free mixtape maker apps for Android. 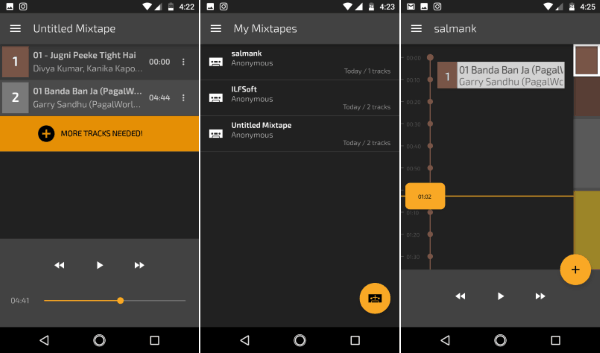 Using this app, you can easily create custom mixtapes by using your favorite songs. It allows you to choose as many music tracks as you want from your phone storage for a single mixtape. There is also no limit on the number of mixtapes you can create for free. One of the best features of this app is that it allows you to backup mixtapes to Google Drive and restore them whenever required on different devices. To get started, install and open up Playlist Maker. After that, click on the “+” button at the bottom and then it will ask you to choose the music tracks for the mixtape. Then tap on the “Tick” button and give a name to the mixtape or playlist. Now, the mixtape will be saved on your phone as an M3U file. You can play it using any music player app that supports M3U playlists. You can also see the mixtapes on this app and can reorder the tracks just by dragging, remove tracks, add tracks, etc. 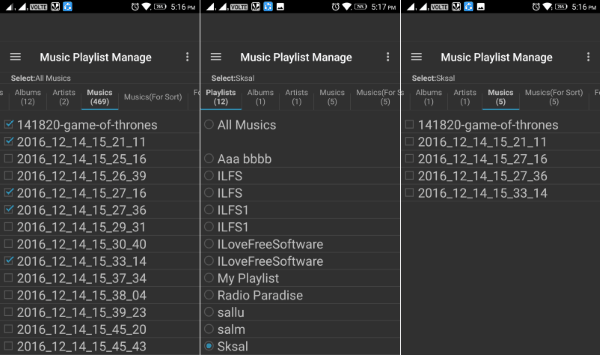 Playlist Manager Pro is also a free mixtape maker using which you can create mixtapes on your Android phone. You can easily choose unlimited songs for a single mixtape. It lets you create as many custom mixtapes as you want and export them for free. One of the useful features of this app is “Fix Play Order” which lets you order the tracks in any way you want. There are many other features available using which you can remove tracks from mixtapes, remove duplicates, create dynamic playlists, share mixtapes, and more. When you open the app, you will see an “Add to Playlists” button on the main. Simply, tap on that button and then you will be able to browse all the music tracks on your phone by Artists, Albums, genres, etc. Now, you can choose the music tracks that you want to add to the mixtape. After selecting tracks, tap on the “+” icon at the top and then you will be able to create a new playlist for your mixtape. The mixtape will be exported to your phone and you can play it with M3U supported music players. Playlist Creator is also one if the best free mixtape maker apps for Android. It lets you easily create mixtapes by compiling your favorite music tracks. You can add unlimited tracks to your mixtapes. After creating mixtapes, you can manually reorder tracks, shuffle tracks, add/remove tracks, rename, and even share your mixtapes with others. It doesn’t have any limit on the number of mixtapes you can create. The best feature of this app is that it comes with a built-in music player which you can use to play the mixtapes directly. After you install and open this mixtape maker app, you will be able to see all the playlists (from any application) on the main screen. Now, to create your own mixtape, simply tap on the “Playlist” icon at the top. After that, you will be able to browse the File Explorer or Music Library and then select the required music tracks. Then tap on the “Save” icon at the top and name your mixtape. This will automatically save the mixtape as M3U file on your phone. You can either use any music player to listen to the mixtape or use the built-in player for that. 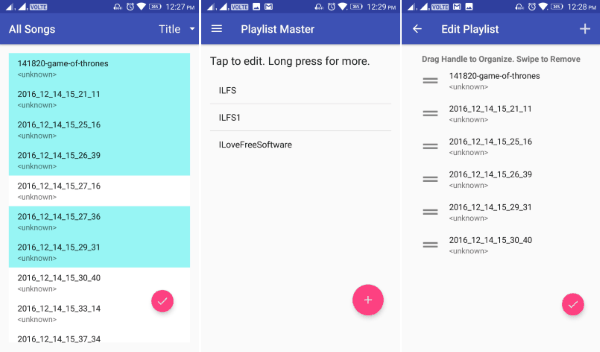 Music Playlist Manage is also a simple mixtape maker app for Android that you can use to compile music tracks into a mixtape. It is completely free to use and you can create unlimited mixtapes. In each mixtape, you can add as many songs as you want. You will also find some basic options to delete tracks from a mixtape, reflect sorted music tracks, import pre-created playlist and use the music tracks, export mixtapes as M3U8 files, etc. The interface is very intuitive such that you can quickly create mixtapes without much effort. After opening the app, you will be able to see all the playlists save on your phone storage on the main screen. Now, to create a new mixtape, simply tap on the “Dotted” icon and choose the “Create Blank Playlist” option. As soon as you do that, you can name the mixtape and proceed to select the music tracks. To do that, select “All Musics” under the “Playlists” tab. Then you can browse the tracks on your phone and select them. After that, tap on the “Dotted” icon and select “Add Music to Playlist” option. Then you can choose the playlist (select the newly created playlist) to add the selected tracks. Now, your mixtape will be ready and you can export it to your phone storage. 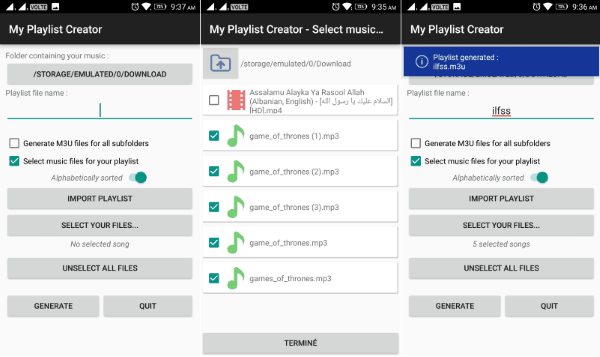 My Playlist Creator is also one of the simplest mixtape maker apps for Android. You can use it to create custom mixtapes in no time by adding your favorite music tracks. The music tracks can be alphabetically sorted in the mixtape. You can add unlimited songs to every mixtape and export them for free. It is pretty easy to use and doesn’t need much effort for creating mixtapes. This app also comes with the option to combine multiple pre-created playlists into a single mixtape. After opening the app, you will see the option to choose the location containing the music tracks on your phone storage. When you do that, tap on the “Select your Files” button and then you will be able to choose the required tracks for the mixtape. Once done, simply enter a name for the mixtape and then hit the “Generate” button at the bottom. As soon as you do that, the mixtape will be exported to your phone storage as an M3U file. You can then use the mixtape on any music player you want. 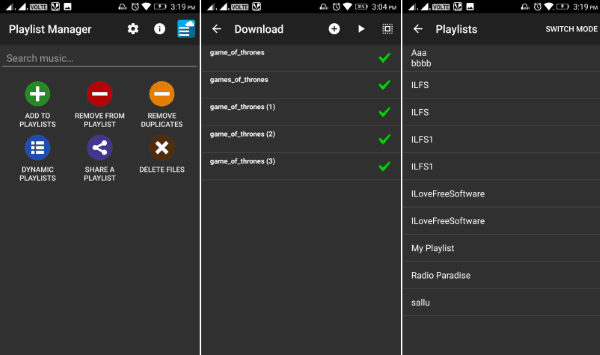 Easy Playlist Editor is another free Android app using which you can make mixtapes. 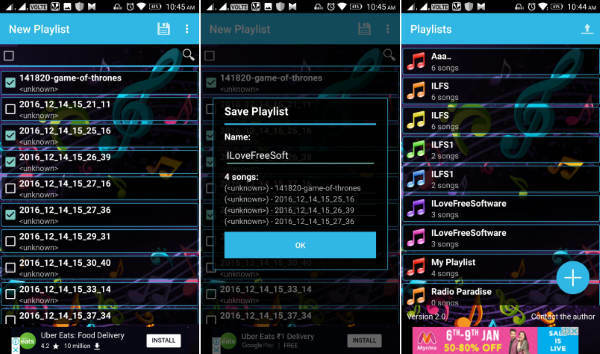 It allows you to choose unlimited songs from your phone storage and add then to a mixtape. It comes with an intuitive interface that allows you to create mixtapes seamlessly. Just open the app, choose tracks, and the mixtape will be ready that you can export as an M3U file. This app also has the option to manually change the order of the tracks in a mixtape. When you install and open the app, you will be able to see all the existing playlists stored on your phone on the main screen. Now, to create your own playlist or mixtape, tap on the “+” button at the bottom. After you do that, it will show you all the audio files on your phone from which you can select the ones that you need on the mixtape. Once you’re all set, tap on the “Save” button and give a name to the mixtape to export it to your phone storage. You will be able to see all the created mixtapes on the main screen and you can also change their order, filter visualization, etc. Free Playlist Manager also lets you quickly and easily create custom mixtapes. You can simply open up this app, browse and select audio files from your phone and then compile them into a mixtape. All the mixtapes can be easily exported to your phone storage such that you can play them via any M3U supported music players. This one also comes with a built-in player, but you can only preview and listen to single tracks instead of the entire mixtape. There are other options available for changing the track’s order, deduplicate tracks, merge playlists, shuffle playlists, etc. To create a mixtape using this app, simply open it up and then tap on the “Circular’ button at the top. After that, it will display all the audio files from your phone and you can choose the required files. Once you do that, tap on the “+” icon at the top and then select “Add a New Playlist” option. Then you can name your mixtape and the selected tracks will be added to the mixtape. The mixtape will be visible on the main screen and you can open it to reorder tracks, delete tracks, edit tag details, etc. You can then export the mixtape as an M3U file. 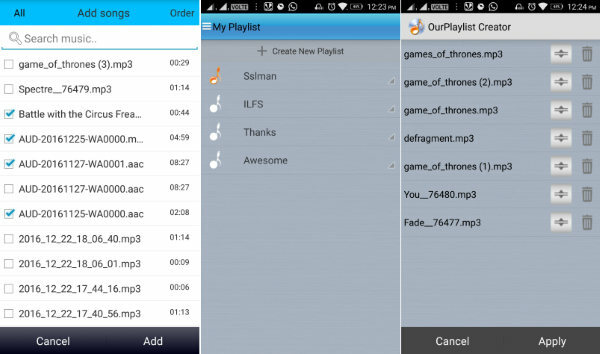 Our Playlist Creator is another similar Android app that allows you to combine music tracks into a mixtape. A mixtape can have as many tracks as you want. There is also no limit on the number of mixtapes that you can create using this app. Creating a mixtape is very simple, as all you gotta do is create a new playlist and start adding songs from your phone. It also lets you order the music tracks in the mixtape by name, artist, album, or date. It even comes with the option to manually reorder tracks just by dragging them inside a mixtape. After you open this app, tap on the “Create New Playlist” button and then name your mixtape. Then tap on the playlist and press the “Add” button at the bottom. Now, you will be able to choose tracks from your phone and add them to the mixtape. Once you’re done with the mixtape, it will be stored in your phone storage and you can play it via any music player app that allows importing external playlists. 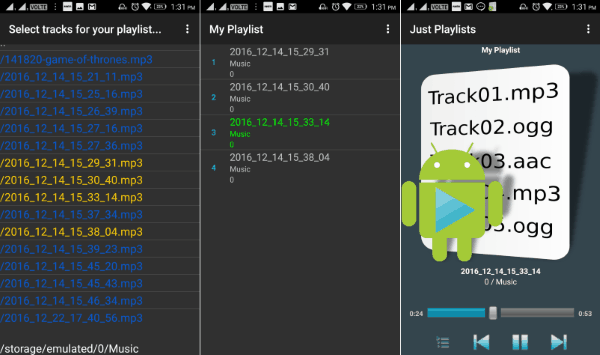 Just Playlist is another free mixtape maker app for Android which you can use to create custom mixtapes. It allows you to simply choose tracks from your phone and combine them into a mixtape. No limit on the number of music tracks for a single mixtape. Create as many mixtapes as you want. One of the best features of this app is that it comes with a built-in music player using which you can play the mixtapes. There are many others useful features available like skip missing tracks from a mixtape, see playlist history, etc. Unfortunately, the playlist editing feature is not available in the free version. After opening this app, tap on the “Dotted” icon at the top and select “Create Playlists” option. When you do that, it will display all the music tracks on your phone and then you can go ahead and select the required tracks for the mixtape. Once done, tap the “Dotted” icon again and select the “Save Selections” option. After that, you can give any name to the mixtape and save it as an M3U file on your phone. Ace Mixtape can also be used to create mixtapes on your Android phone. Unlike the other apps in this post, the free version of Ace Mixtape does have some limitations like you can only include up to 4 songs in a single mixtape, etc. However, it lets you create as unlimited mixtapes for free. There are many other useful tools available using which you can trim the music tracks, reorder tracks, change the volume of each track, set fade in/out, and more. The timeline feature is also pretty useful as it can help you define the playback duration. To get started, open the app and then you will see the option to add tracks on the main screen. Now, tap on the option and then you can choose one song at a time and then continue to add all the songs for the mixtape. Once you’re done adding tracks, click on the “Hamburger” icon and then you will be able to add mixtape title and author name, adjust tracks duration on the timeline, etc. Once all set, the mixtape will be saved automatically on your phone storage and you can play it directly on the app or use other music players. 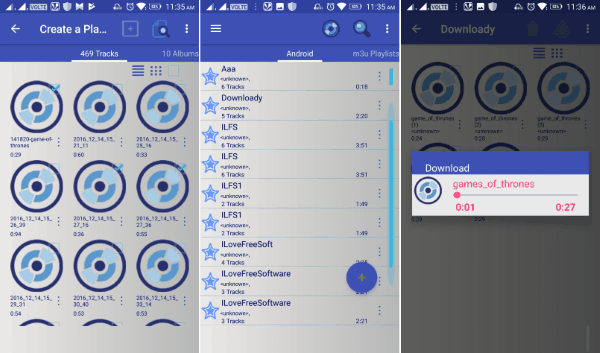 So, if you have been looking for apps to create custom mixtapes on your Android phone, then these mixtape maker apps can help. All of these apps are super simple to use and you can compile all your favorite songs into a mixtape in no time. Personally, I think all these apps as perfect for creating mixtapes.